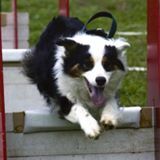 Everything and more that you will need for flyball and dog training. Fitting for flyball harnesses on the night. This entry was posted in Stallholder. Bookmark the permalink.